Growing network complexity necessitates tools and methodologies to automate network troubleshooting. 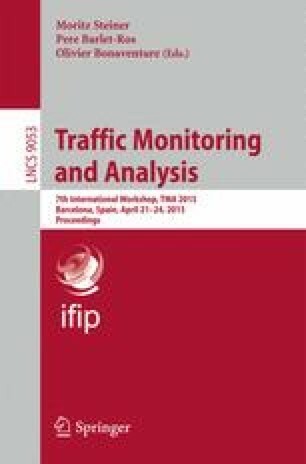 In this paper, we follow a crowd-sourcing trend, and argue for the need to deploy measurement probes at end-user devices and gateways, which can be under the control of the users or the ISP. Depending on the amount of information available to the probes (e.g., ISP topology), we formalize the network troubleshooting task as either a clustering or a classification problem, that we solve with an algorithm that (i) achieves perfect classification under the assumption of a strategic selection of probes (e.g., assisted by an ISP) and (ii) operates blindly with respect to the network performance metrics, of which we consider delay and bandwidth in this paper. While previous work on network troubleshooting privileges a more theoretical vs practical approaches, our workflow balances both aspects as (i) we conduct a set of controlled experiments with a rigorous and reproducible methodology, (ii) on an emulator that we thoroughly calibrate, (iii) contrasting experimental results affected by real-world noise with expected results from a probabilistic model.